Summer is here which means one thing, everyone is obsessing over their summer body! It's that time of year again when you've got to get into a bikini for the holiday you booked a year ago and swore to yourself you'd get in shape for. I bet you're sitting there wondering how it came round so quickly and I'm sure many of you are feeling anxious about the thought of putting that bikini on because of low self esteem or not being body confident. Exercise is definitely a mood booster and when the endorphins kick in so does the post workout feeling of bliss. However, staying motivated can be the hard part, so find a workout you love doing! If you enjoy your workout then you'll definitely find it easier to stay focused, become more engaged and maintain consistency, all which will help you get closer to your goal! Everyone comes in different shapes and sizes and it's about time you embraced your uniqueness. Imagine how boring the world would be if everyone looked the same. Everyone has flaws/weaknesses, even the people you wish you looked like on social media and so you should start loving your imperfections. Next time you're standing in front of the mirror naked, look at yourself and instead of thinking about the things you dislike, think about the things you like. We're all so bad for not looking at our strengths, but it's about time we did. Being confident and having a high self esteem is often associated with being arrogant but remember there is nothing wrong with loving yourself! This is a number one must!! Standing on the scales every morning is only going to create a negative mindset. Don't get me wrong, if you've lost 3lbs then I'm sure you'll walk to work with a spring in your step, however if you've put weight on you'll stand off the scales feeling rubbish and it just sets you up for a bad day. What you need to know is that your body weight can alter for a number of reasons with the main culprit being water, so if you need to weigh yourself do so once a week and in the meantime hide the scales.... You're much more than a number. Cast your mind forward twenty years and think about the body you're likely to have then. Unfortunately gravity is not our friend and our metabolisms will most likely slow down. So embrace the body you have now and own your curves! Be whatever shape and size you want to be as the only person you need to impress is yourself, you shouldn't care what anyone else thinks. So if you want to wear that tight dress then wear it! The problem isn't with your body, it's with the way you look at it and what you think of it, so change the perspective on how you look at yourself. Lastly I want to remind you that everyone has down days, days when they don't feel great, days when they cry or aren't happy with the way they look... you're not alone! 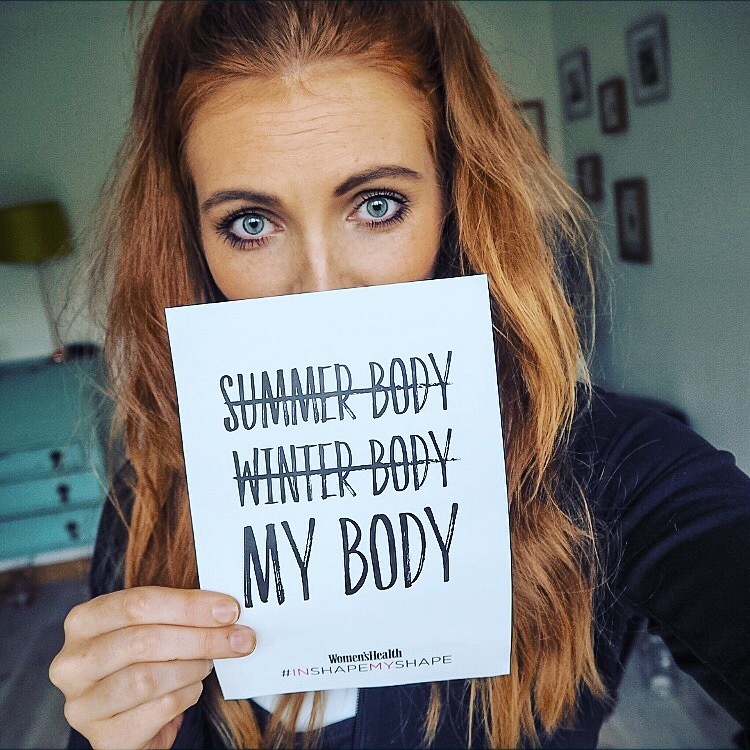 As demonstrated by the Women's Health #InShapeMyShape campaign, accepting your body's shape and size and loving yourself is the healthiest place to be, and don't forget to remind yourself everyday that you're awesome! !